While we were left drooling over the hint of relationship we'd seen between Zoisite and Kunzite, there was another relationship that fueled many imaginations too (not mine, though) : Sailor Moon's best friend, Naru Osaka (who doesn't know about Usagi's super-heroine alter-ego) fell in love with Nephrite under his earthling disguise. 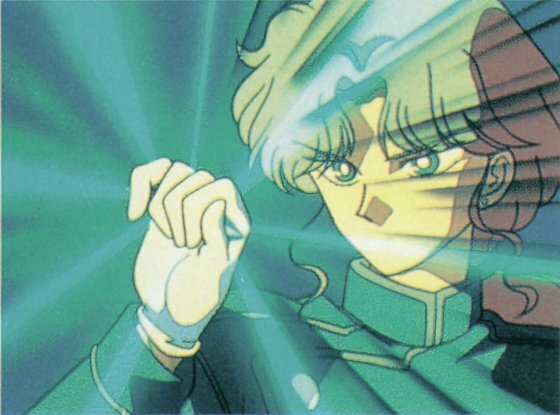 Her love was so strong that the black crystal used by Nephrite to track the Ginzuishou reacted to it, leading Nephrite to believe that she had something to do with the Ginzuishou. 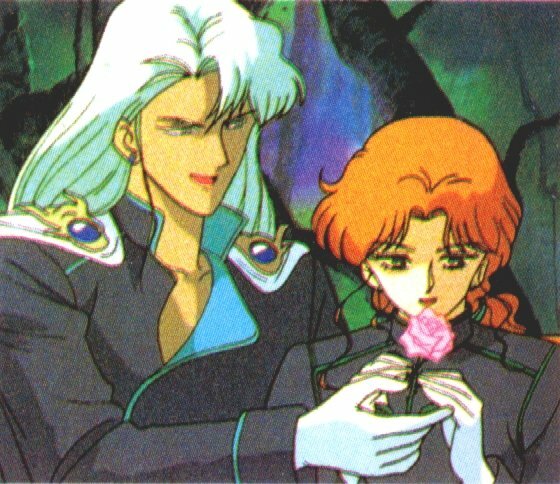 He made up a plan to make her get it for him, and Zoisite, seeing that, mistook it for a genuine interest/feeling from Nephrite for the girl. Which in his mind was a weakness to take advantage of, and another reason to kill him (since he would be betraying the Dark Kingdom by loving an earthling). 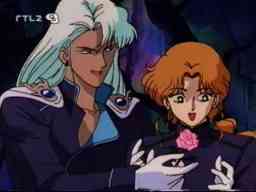 And so, Zoisite had his youma kidnapping Naru, setting a trap for Nephrite. This one, after saying that he had no point in rescuing Naru, actually did go to save her... 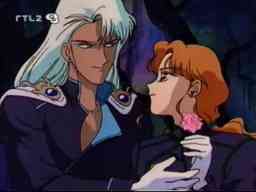 He managed to escape with her, but the youma went after them and badly wounded Nephrite. The 3 Youma were killed by the senshi, Zoisite left with the black crystal. 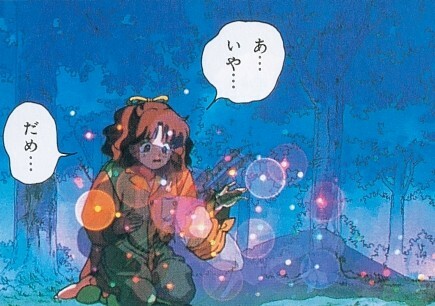 And Nephrite died in Naru's arms, dissolving into small light dust. 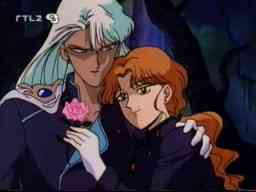 IMO Nephrite didn't actually love Naru, he hadn't have the time for that. I think he was slowly on the way to develop feelings, but it was still a long path to go before he would actually be able to love Naru in a romantic way. Back to my favorite villains. Nephrite being dead, Zoisite became the front General. Beryl modified the Black Crystal so it could track the 7 Nijizuishou (Rainbow Crystals), each sealed with a youma in the body of a mortal. Most of which appeared to be related to the Senshi somehow. One of them is a beautiful woman, girlfriend of Motoki (a friend of Sailor Moon who works in a game shop). Seeing them in the vision conjured by the black cristal, Kunzite comments "She's beautiful. It's almost a pity we have to kill her". Zoisite takes it real bad, and starts pouting (something he masters...). 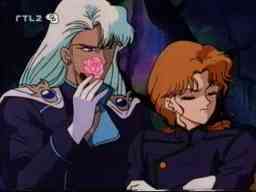 Seeming quite amused by his jealousy, Kunzite conjures a rose and offers it to his little rat, telling him "Utsukushii omae ni shitto wa niawanai" ("jealousy doesn't suit your beauty". Yeah, this one took me long to figure out, as it had obviously been changed in the french version, that censored the homosexual relationship between them by making them being brothers...). Isn't that the cutest thing you've seen? Well, no. Actually, you can wonder if it is not manipulation from Kunzite, considering his smile at Zoi's reaction, and his dark, rather cruel face on the last picture. There's always a hint of doubt about the whole thing, which makes it especially interesting.